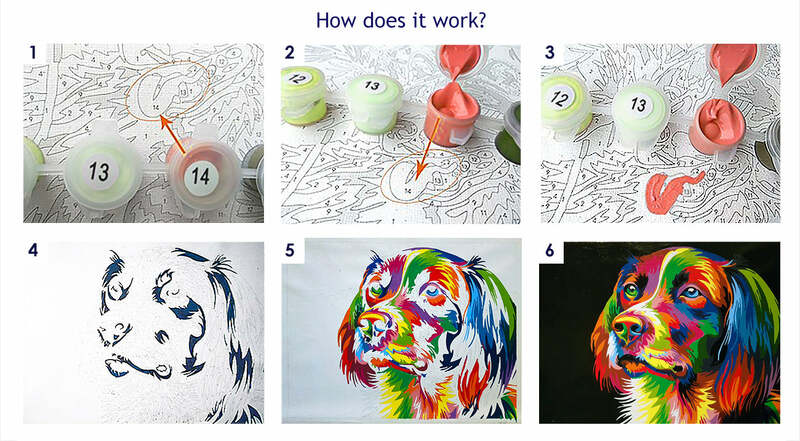 Discover our new exclusive series of Craft-Ease™ Paint By Numbers by Independent Artists. The entire series is a new and exclusive collaboration with independent artists around the world. Our mission is to help them get more exposure and get retributed for every painting sold. So if you want to support an artist, just get one of their art as a Paint By Numbers and enjoy a relaxing time painting it for yourself! With Craft-Ease™ Paint By Numbers, you can re-create every detail of the paint on your own. You become the artist. Here is how: The blank Canvas is filled with numbers. Each number is a color. Each color fills the paper. Follow the number, become the painter. More than just a hobby, painting with Craft-Ease™ Paint By Numbers is the best way to let your artistic talent come to life while supporting the artist that created it for you. And here is the best-hidden secret: It's super relaxing and kind of meditative. All our customers are telling us the same thing: It just feels so good and relaxing, it's almost like a therapy. So please enjoy and have a great painting day. And here is the best-hidden secret: It's super relaxing and kind of meditative. All our customers are telling us the same thing: It just feels so good and relaxing, it's almost like a therapy. So please enjoy and have a great painting day. >> Looking for a different style? Check out our entire collection of Independent Artist Series here or any of our best-seller standard series of Craft-IT™ Paint By Numbers Kits here.